I love this casual Friday outfit. It’s all basics – neutral sweater, neutral shoes and black pants – plus one fun pop of color in the scarf. The magic of accessories is they take boring and bland and change it to fun and chic. I love it. I needed a great idea this morning to get dressed and this is perfect! Plus, at 8 months pregnant, using neutrals with a simple pop of color like a scarf to make my outfits look different has been my MO. Thanks for the inspiration! 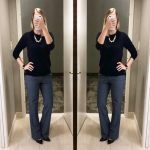 I like your dressing idea, but grey sweater and skinny blue jeans also a perfect dressing specially for office house wife. If you want to shop such kind of dresses then first check the latest fashion trend this may help you to select the right clothes for own. I really like this outfit. It looks comfy yet polished and is something I could easily do from my own closet.